UPDATE: Belinda, Daniel and Michael were found safe having survived six days in the Oregon forest. They took shelter in a hollowed-out tree. They were spotted by a helicopter pilot and flown to the hospital. Belinda and Daniel Conne, 47 along with their son, Michael, 25, went missing Sunday during g a trip to pick mushrooms at Saunders Creek in Oregon. The trio did not return to their campsite in Huntley Park after going off to pick mushrooms around noon. They left behind their two dogs. Authorities found their red Jeep Cherokee off of U.S. Forest Road around 10:30 a.m. on Wednesday. There clothing and mushroom-picking gear was found farther away from their vehicle. They have not been able to track their location as weather their cell phones had been turned off or they are out of power. Searchers resumed looking for the Conne family near the Rogue River in southwestern Oregon on Thursday. 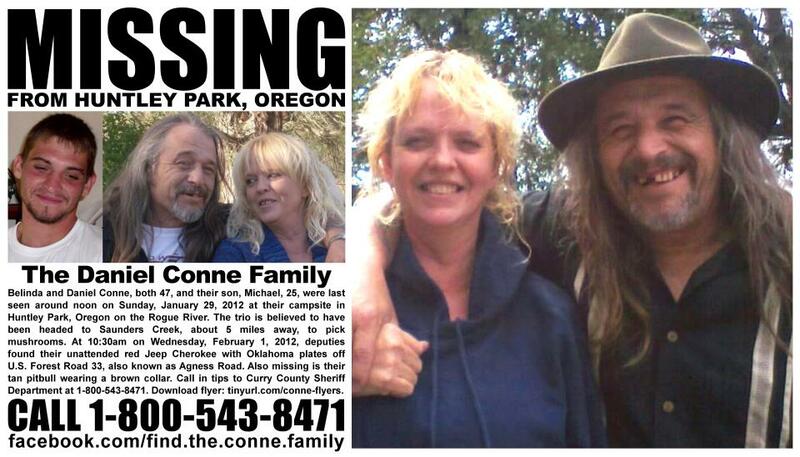 If you have any information about their whereabouts, please call the Curry County Sheriff’s office at 541-247-3242.